My husband has decided he needs to lose weight. Whenever he does that, he stops eating cold cereal and eats oatmeal every morning for breakfast. But he never puts milk in it. And he keeps buying milk that expires about 10 days later. What to do with all that milk before it goes bad? I often turn a couple of cups into delicious home-made pudding. 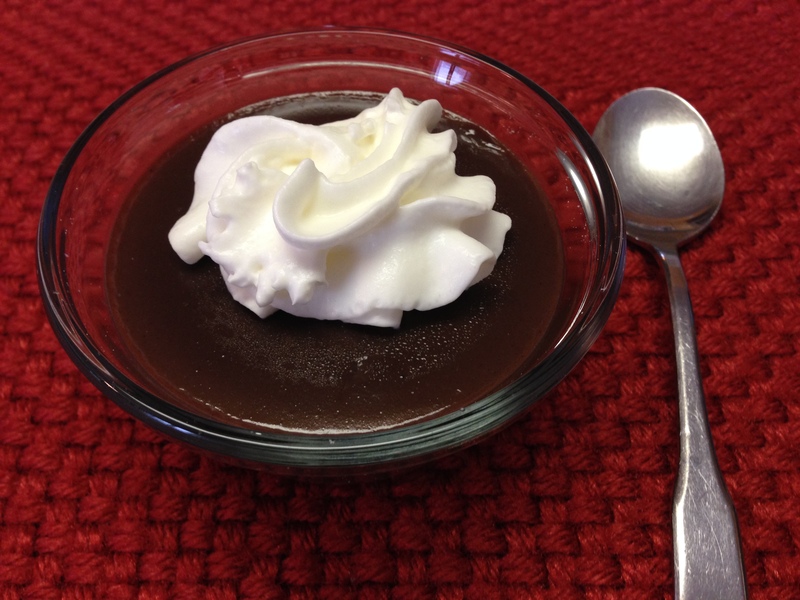 It’s not much harder to make your own pudding “from scratch” than to buy a box of pudding mix (filled with preservatives and other chemicals), and it’s undoubtedly cheaper. 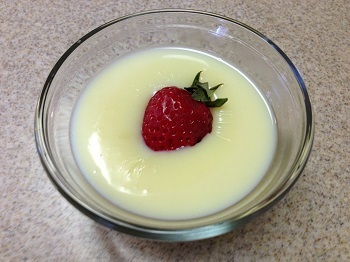 When I make vanilla pudding, I like to add a drop of yellow food coloring at the end so the pudding doesn’t look so unappetizingly white. You can reduce the calorie count by using low-fat or fat-free milk and substituting Splenda for the sugar. If you don’t have a large household to feed, you can easily halve this recipe to make four half-cup servings. Mix the sugar, corn starch, the cocoa if making chocolate pudding, and the salt in the top of a double boiler. Gradually add the milk, whisking until smooth. Place over simmering water and cook, stirring constantly (using a wire whisk works well), until the mixture thickens. Continue cooking 5 minutes longer, stirring occasionally. Remove from heat and blend in the vanilla. Pour into serving dishes to cool. Chill before serving. Need a fancy-shmancy but easy-to-make dish to bring to a festive New Year brunch? This is just the thing! This recipe came from a Detroit newspaper but I can’t remember which one. It says it comes from Barbara Klein of West Bloomfield, who got it from her mom, Irene Eagle. The original recipe was very sweet, so I cut back on the sugars a little. 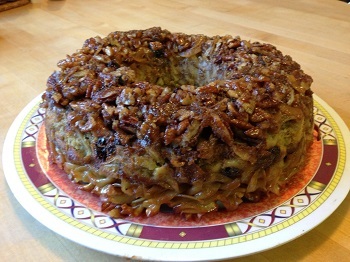 The hardest part is getting the kugel out of the Bundt pan without breaking it, so be sure to grease the pan very well. When you pour the melted butter into the pan, be sure to swirl it around so it coats the entire bottom of the pan. Cook the noodles according to the package directions and drain. Spray a bundt pan with cooking spray. Pour ¼ cup of the melted butter into the bundt pan. Sprinkle the brown sugar over the butter and place the chopped nuts over the brown sugar. In a large bowl, mix the remaining ingredients. Add the noodles and mix thoroughly. Pour into the bundt pan and bake about an hour until the kugel is firm and brown. Remove from oven, loosen the sides with a spatula and turn the pan upside down on a serving plate. Scrape out any topping that remains in the Bundt pan and press onto the kugel. This is my favorite winter soup recipe. I adapted it from one I got at a Weight Watchers meeting many years ago; I make it every winter. It can stand on its own for lunch – or add a salad and some crusty bread to make a nice dinner. The hardest part of this recipe is opening and recycling all the cans! 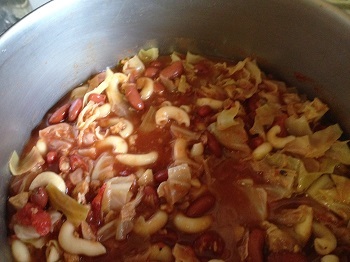 The recipe makes a huge potful of soup, but it lasts well in the fridge. The original recipe says it is 3 points per 1½-cup serving, but the Weight Watcher system has changed since then so I can’t say what the points value is now. If you use vegetarian soy crumbles instead of beef, as I do, the soup will have fewer calories and less fat. You can also use high-fiber pasta. Even with regular pasta, it’s high fiber and low fat – and very tasty. If you use beef, heat the oil in an 8- or 12-quart Dutch oven or stock pot over medium heat and cook the beef until browned, stirring to crumble it. Drain well and return to pan. Add all remaining ingredients except pasta. If you use veggie crumbles instead of beef, add them at this point as well. Bring to a boil, reduce heat, and simmer, uncovered, 2 to 3 hours, stirring occasionally. Add a little water if the soup seems too thick. After 2 hours, raise heat if necessary to bring soup to a boil. Add pasta (if you use spaghetti or angel hair, break it into small pieces) and cook at medium-low heat for another 8 to 10 minutes until pasta is done. 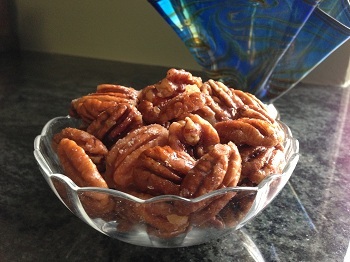 After a weekend of gorging, I thought everyone might be ready for a lighter recipe! This recipe is adapted (very slightly) from one in Jerusalem: A Cookbook by Yotam Ottolenghi and Sami Tamimi. It’s easy and delicious. The book is absolutely gorgeous and would make an excellent gift or look good on a coffee table. Many of the recipes are interesting, although some of the ingredients may be difficult to find in the United States. We’re lucky to live in an area with a large Middle Eastern population, so I had no problem finding pita or sumac powder. I didn’t have any chile flakes (which are easy enough to find) so I used cayenne pepper, about half as much as the recipe calls for. Put the vinegar, onions and dates in a small bowl. Add a pinch of salt and mix well with your hands. Allow to marinate for 20 minutes, then drain out any residual vinegar and discard. Heat the 3 Tbs. olive oil in a medium frying pan over medium heat. 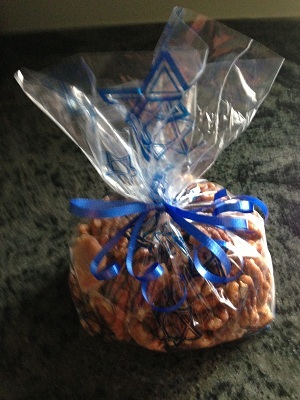 Add the pita and almonds and cook for 4 to 6 minutes, stirring all the time, until the pita is crunchy and golden brown. Remove from the heat and mix in the sumac, chile flakes and ¼ tsp. salt. Set aside to cool. 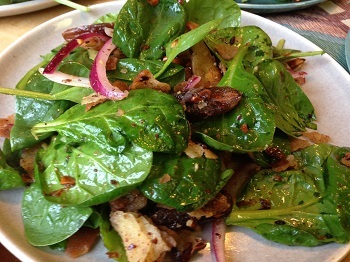 Just before serving, toss the spinach leaves with the pita mix in a large mixing bowl. Add the dates and red onion, the remaining 1 Tbs. olive oil, the lemon juice and another pinch of salt.